LEFT IN THE DARK: 13 Investigates reviews calls into Deer Park's 911 Center that reveal a lack of basic information about the fire the entire time. 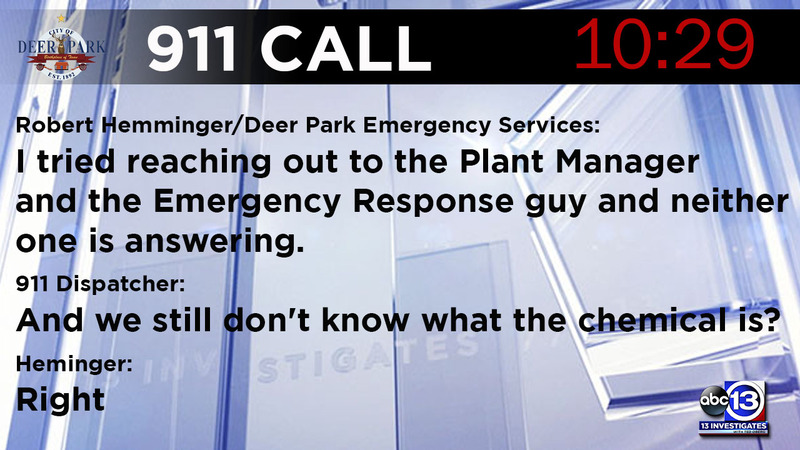 DEER PARK, Texas (KTRK) -- Just after 10 a.m. on Sunday, March 17, the calls started coming to the Deer Park 911 Center. "You have calls about the black smoke yet?" 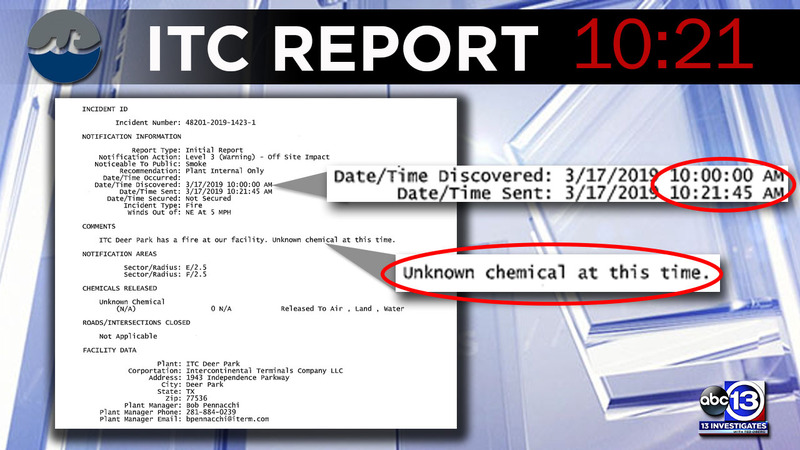 asked the first caller at 10:03 a.m.
ITC documents show the fire started at 10 a.m. Deer Park got another call at 10:04 a.m.
"I can see a lot of big flames and thick black smoke." But 911 operators didn't have any information about the fire from the company. 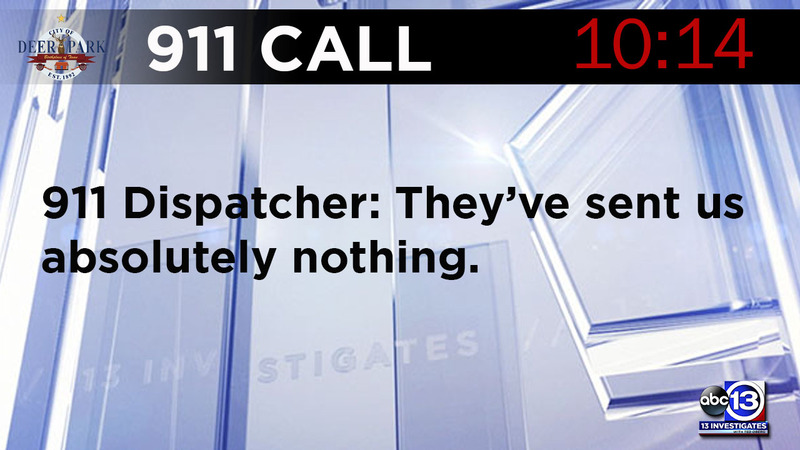 At 10:14 a.m., another caller finally gave 911 call takers the location. "It looks like ITC is having a fire, they haven't posted anything about it. Do you know anything about it?" Deer Park 911 dispatchers didn't, and according to dispatchers, neither did Deer Park's Director of Emergency Services, Robert Hemminger. "They've sent us absolutely nothing," the 911 operator told a caller at 10:19 a.m.
13 Investigates reviewed the first hour of calls to Deer Park's 911 center. 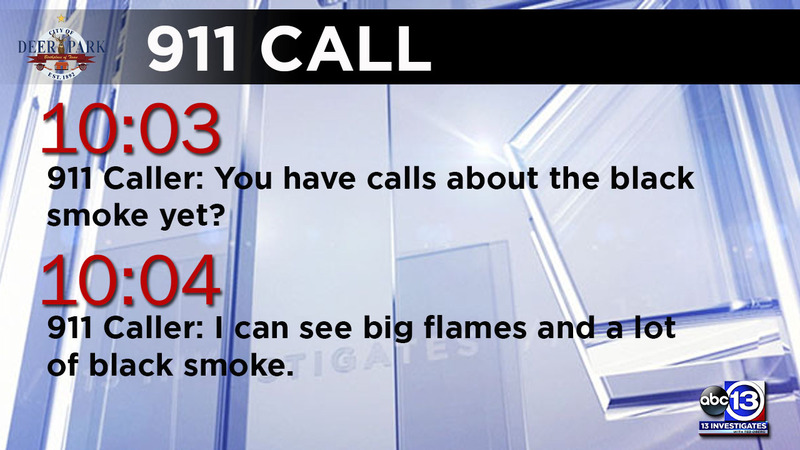 The calls reveal a lack of basic information about the fire for the entire time. The company didn't send out its first notification until 10:21 a.m. It didn't include any information about what was burning. That information can be critical to first responders and emergency managers as they figure out if evacuations are needed and what precautions firefighters need to take as they race to the scene. ITC stores 13 million barrels of petrochemicals at the Deer Park site. Its business depends on knowing exactly how much of what chemical is on site, when it arrived and when it ships out. Dispatchers relayed the information to another caller at 10:24 a.m.: "It just says there is a fire at our facility. Unknown chemical at this time." All of it left the director of Deer Park's Emergency Services in the dark. Robert Hemminger called 911 operators at 10:29 a.m. as the debate about a shelter-in-place starts. "I tried reaching out to the Plant Manager and the Emergency Response guy and neither one is answering," Hemminger tells a dispatcher, who then asks, "We still don't know what the chemical is?" Two minutes later, Precinct 8 deputy constables directing traffic near the plume have concerns. 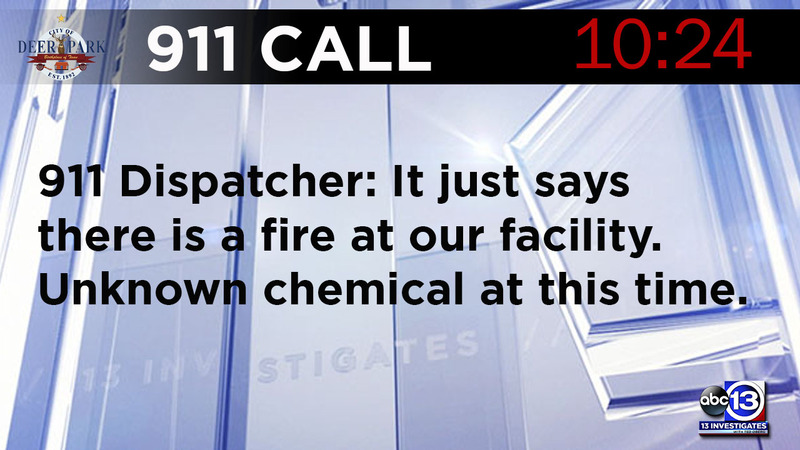 Their dispatcher called Deer Park to ask, "Do you know what chemical it is burning?" The dispatcher replies again: "We have not received any information from the plant." At 10:42 a.m., the Harris County Hazardous Materials team asked Deer Park what was burning. Again, the dispatcher has to tell them, "We have no clue. We're still waiting on the chemical plant to give us better information." At 10:47 a.m., Deer Park's assistant fire chief is still in the dark, even as his personnel are deployed outside the gate. 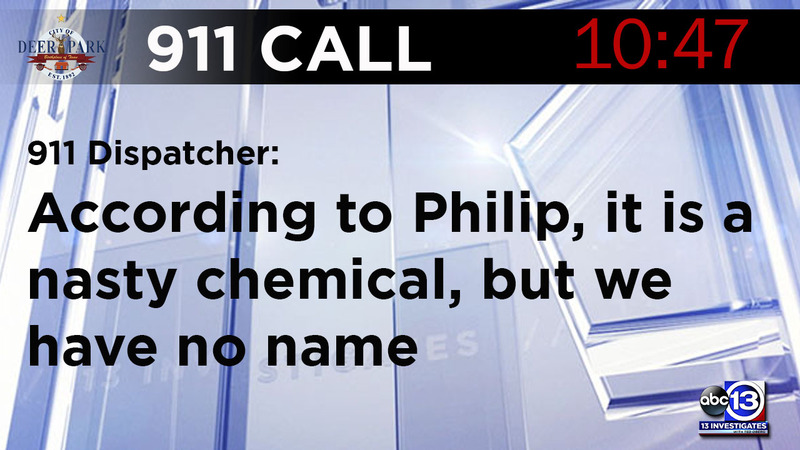 "According to Philip, it is a nasty chemical, but we have no name." It continued. In a call 53 minutes after flames and thick black smoke were first spotted, the dispatcher tells at least the 7th caller ITC still had not told first responders what they were dealing with. 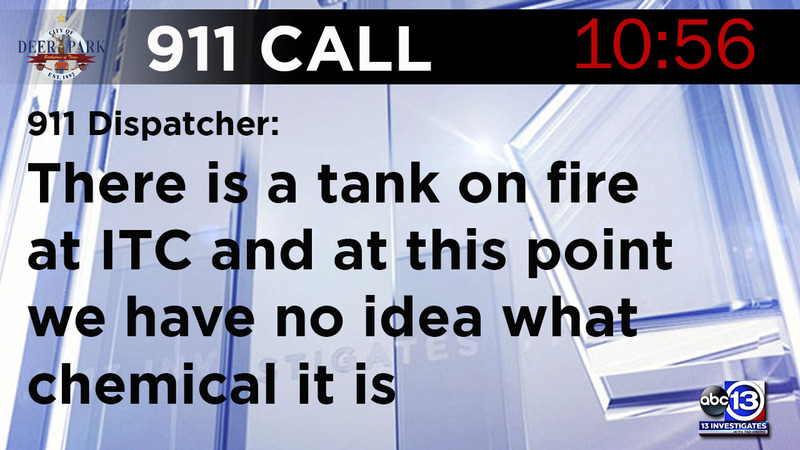 "There is a tank on fire at ITC and at this point we have no idea what chemical it is," the dispatcher said. The Joint Information Center asked for questions in writing about ITC's response. 13 Investigates sent several questions shortly after noon on Tuesday. There's been no response. As soon as there is, we will update this post. 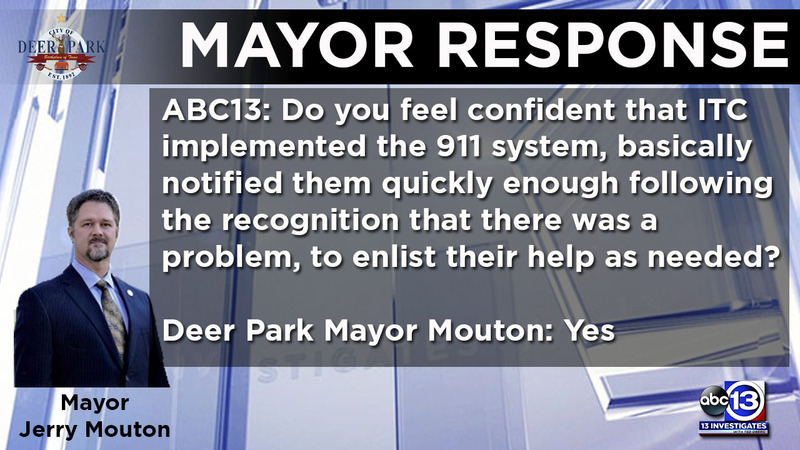 As 13 Investigates reviewed the calls, we had a chance to speak with Deer Park Mayor Jerry Mouton. "Do you feel confident that ITC implemented the 911 system, basically notified them quickly enough following the, you know, recognition that there was a problem, to enlist their help as needed?" Mayor Mouton approached the microphone at this morning's ITC news conference, said "Yes," and turned away from the podium. 13 Investigates also reached out to Deer Park with questions for the mayor and Director of Emergency Services. None of those calls or emails were returned.